The leaders of the SDLP and the Alliance Party are to run in the European Parliament election race. It is expected the UK will participate in the EU election on 23 May after a new Brexit date was set for 31 October. 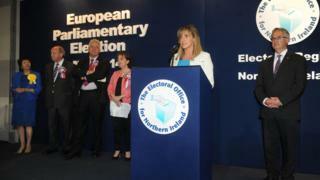 Outgoing MEPs Martina Anderson from Sinn Féin and the DUP's Diane Dodds are standing for re-election. Former Ulster Unionist minister Danny Kennedy has launched his candidacy after the party's MEP Jim Nicholson decided to step down. The SDLP leader Colum Eastwood and his Alliance Party counterpart Naomi Long have declared that they will stand as candidates. The TUV leader Jim Allister has also confirmed that he will stand in the European Parliament election. The Green Party has confirmed party leader Clare Bailey as its candidate. UKIP has announced it is running Robert Hill as a candidate in Northern Ireland. The Conservative Party has announced its candidate will be Amandeep Singh Bhogal. The DUP and Sinn Féin claimed more than 45% of the vote combined in the 2014 poll and are expected to retain their seats. But the battle for the third seat could be close. Mr Nicholson claimed his seat for the Ulster Unionists last time after securing more than 2,000 extra first preference votes than the SDLP's Alex Attwood. He was elected on the eighth count when the gap widened to slightly more than 40,000 votes after transfers. Women's Coalition founder and former deputy speaker of the Northern Ireland Assembly Jane Morrice is also set to contest the election as an independent candidate. Independent candidate Neil McCann will also contest the election. Former SDLP leader Mark Durkan is hoping to win a seat for Fine Gael in Dublin.